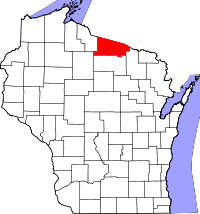 Vilas County marriage vital records date to 1855, well before its founding in 1893 out of Oneida County, but birth and death records date only to 1889. Recordkeeping before the statewide registration law of October 1907 was erratic; extant historical records are located at the Wisconsin Historical Society, with a statewide index available. Copies of current records, 1907present, can be obtained locally from the Eagle River Register of Deeds, with divorce records from the Clerk of Court, for $20 by mail or from the Wisconsin Department of Health Vital Records Office in Madison by mail, fax, or in person, and online through VitalChek. Certified copies are restricted.